All right guys, it’s time to look at one of my most ambitious articles yet! In this one I rank all of the lyrical RWBY songs from worst to best. It took quite a long time to listen to them all and start the ranks but it was certainly worth it. Some songs were higher than I thought and others were lower. For example, I usually thought of Weiss’ volume 4 song to be her best one, but it actually ended up losing to two of her others. It’s always nice to listen to the classic tunes again to really appreciate where they go. Over 90% of the RWBY songs are excellent so even low scoring ones can be quite great. Naturally the volume 6 tunes are incomplete so we’ll have to work with what we have. That’s enough of an intro though, lets get to it! One thing you can see from this collection of songs is that most of them are quite emotional. Nothing wrong with a good emotional song of course. Most of these have fairly catchy beats and all, but they aren’t as blood pumping as the ones that are higher on the list. I love the more adrenaline based songs of RWBY so naturally these would be fairly low. Still, they are well written. Ignite is one of the few songs where I thought it sounded a lot better before the full version was released. The rap section wasn’t all that great and some extra instruments were added which takes away from the impact of the song. Big Metal Show is just a bit too loud to fully enjoy which definitely ends up holding it back quite a bit. While Caffeine is a very action heavy song, it’s just not as soothing to listen to as most of the other tunes. Neon has a fairly catchy theme but the lyrics don’t really work for me. All That Matters was a nice emotional song. I think it succeeded more than some of the other similar style tunes we got. Red Like Roses is definitely a classic song. As the first RWBY song to ever come out it is certainly pretty nostalgic. There aren’t a whole lot of lyrics here, but the beat is solid and really works well with the action scene. We got a good remix in volume 6 and I wouldn’t be surprised if we get another one towards the end of the series. It’s definitely a good example of a song being carried by a great beat. Rising was a good theme song. It may not have the same energy as some of the other openings, but it’s good. I May Fall for example did a good job of showing that the series was about to escalate the stakes quite a bit. I was not all that impressed with Lusus Naturae at first. The song’s beginning is rather rocky, but from there it has one of the best beats in the series. Likewise, Nevermore is a really nice song, but just a bit rough around the edges compared to some of the other songs like Miracle. Bad Luck Charm makes for an epic song even if Qrow is whining for most of it. It worked really well for his fight scene. Indomitable is one of those songs we haven’t heard much from yet, but what we got was very nice. I think this song could certainly rise up the charts once we get the first version. 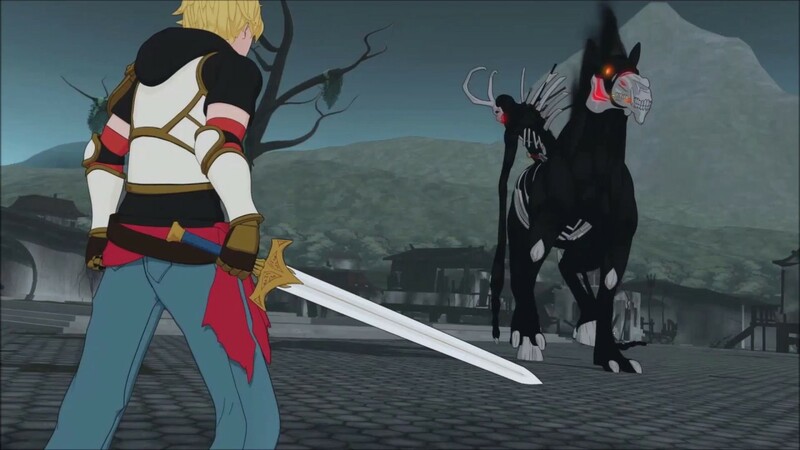 The Triumph was a nice return to form for RWBY as things finally started looking up for the heroes in volume 5. It’s a solid intro theme that is pretty uplifting. I Burn (clean version of course) was a great theme ofr Yang as it really highlights her fighting spirit and the brutal nature of her fighting style. Weiss has two songs in a row here with both of them being quite good. Her ongoing plot with the mirror in the songs is always fun and trying to resist her family lineage makes for great lyrics. Then From Shadows does a great job of effectively having two different songs merged into one. The beats go up and down but with rhyme and reason that keeps it on the higher end of the RWBY songs. We’re getting close to the top now. Part 2 of Red Like Roses is a great sequel to the original. It’s very fast paced and fits any action scene. Miracle was a very impressive song from Volume 6 that helped start the volume on a high note. It’s really well written and the song just pops out at you. All Things Must Die is a great song for Raven/Cinder. It feels like a nice semi sequel to Die even if they might not be in direct connection. Die will always be an excellent song and Lionized really shows you Adam’s original goals. He may not have gone down the right path, but he did help the Faunus get a lot of respect through fear thanks to his actions. This is definitely a great song. It has a perfect blend of action themes while also being fairly emotional. It’s a shame that this wasn’t able to play during the recent Yang vs Adam fight as it would have been awesome to see even if maybe a little too obvious. Still, it’s an excellent song and it’s going to be tough to top that one for the Yang themes. As Neo is one of the best characters in the show it makes sense that she would have an awesome theme to go along with that. We’ve only seen a glimpse of the song so far, but it’s already shaping up to be one of the all time greats. It does a good job of telling Neo’s story as she doesn’t talk in the series. This is a fairly close second place. Divide makes for a perfect villain theme with Salem basically gloating the whole time. It was perfectly timed for the credits and would work really well as a battle theme as well. It probably comes as no surprise that this is the best RWBY song of them all. It’s basically perfect and really helped start the series on a high note by having this as the theme song. I do hope we get this for the final fight in the series because that would be awesome. I’ve heard this song hundreds of times and will certainly keep hearing it as it’s quite timeless. Well, those are my RWBY song rankings. The series has definitely delivered with a ton of awesome songs. I don’t see any dethroning the number 1 song here, but anything’s possible. Now the wait for Volume 7 continues. It’s time to take a look at RWBY Volume 6. This show is still the greatest of all time and volume 6 is a real return to form in many ways. We get to see some old characters, questions from way back in volume 1 are finally answered and even the fight scenes are back to their prime. While Volume 3 is still the best, Volume 6 easily climbs its way up to being the second best volume. It’s just a great time to be a RWBY fan as we also have the current manga going and other projects lined up. It’s all most impressive I must admit. Volume 5 ended with the team finally managing to secure one of the 4 relics. They now plan to go to Atlas in order to have Ironwood secure the relic while also getting a lead on the next one. Unfortunately getting there won’t be very easy as Salem’s group, Cinder’s Group, and other enemies all plan to stand in their way. 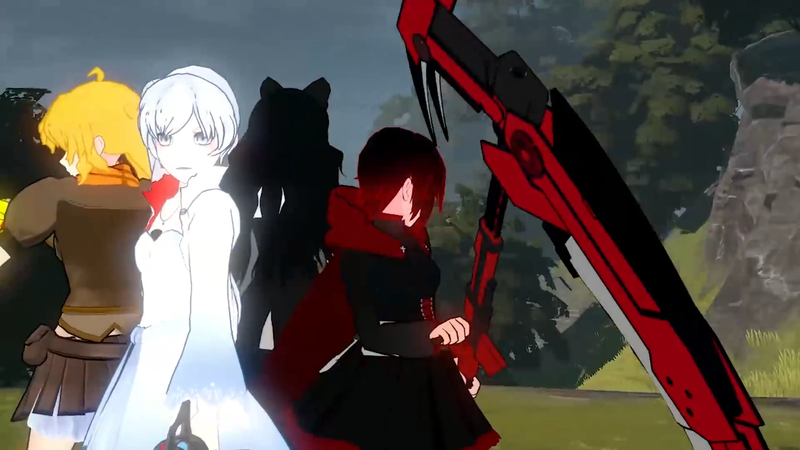 Fortunately, team RWBY is finally united once more and together they can stand up against any force. Physical threats may not be what they should fear though as certain truths come out which force them to re-think their entire mission. As always the soundtrack for this volume is quite amazing. RWBY has never had a weak volume, but that just makes this all the more impressive as it’s tough to just keep on churning quality tunes like this. The best themes are the Neo theme, Adam theme, and Miracle. Then we have other high quality songs like the volume 6 intro and the emotional theme for Pyrrha. The only theme that I’m not crazy about is the one for when the team fought the robot, but of course it was just a small sample so we’ll see what the full theme sounds like. It’s hard to say how the soundtrack stands up to previous volumes, but it’s definitely 5/5 star material. Then we have the animation which is great. As I mentioned in the intro, the fight scenes have been vastly improved. 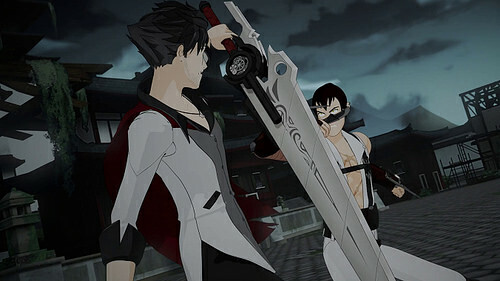 We’ve already seen the potential that this post volume 3 animation style brings through dynamite fights like Qrow vs Tyrian and Raven vs Cinder, but Rooster Teeth seemed to be having some trouble really getting the heroes to fight the way they used to. Well, whatever they did between volumes worked as we get a dynamite action scene in the premiere and then we get other battles like Cinder vs Neo and Adam vs Yang which are top notch. As fight scenes are one of the reasons why the series got so big in the first place it’s great to see them return. It’s no small reason as to why the volume was so good. Of course, then we also have the excellent writing to thank as well. The series has always been able to grab your attention with ease and this one is no exception. I’m definitely enjoying the plot and the character interactions are always on point as well. We’re finally getting most of the questions in the series answered to the point where it feels like we could reach the end game soon. As each volume is about as long as a movie I think we could reasonably end the whole saga by volume 9, but there are also enough supporting characters and sub-plots going on that it could last til way after that as well. Either way I’m cool with that. If any part of the writing can be a little weak it’s in the humor. The characters from Atlas seem a little too extreme at times. Calavera and her rival aren’t particularly amusing. Nor are the two bodyguards. Still, it could be way worse of course. I’ll take a little forced humor over crude humor gags which the show has always avoided. A big character in volume 6 is certainly Adam. He got his own short before the volume aired and the writers hyped him up quite a bit. After 5 volumes of appearing once in a while, his character arc was finally going to end here. His character has had a very mixed history over the years. While he was well liked in the first two volumes, people started to lose faith in him by 3. Volume 5 wrecked him for most fans to the point where it was too late by volume 6. He’s still my favorite character in the series, but you can definitely see why he isn’t for everyone. I’ll probably write some kind of article on him soon so I won’t go too into detail here. He gave us some great fights in 6 and has solid dialogue throughout. He may not be a fan favorite, but he definitely works well as the big boss of the season. Another character who got a lot of attention here was Salem and through her development we saw more of Ozpin as well. This was the longest episode in the season which makes sense because it finally told us the true origin of this end boss and why she turned to the dark side. It’s a very interesting episode and you ultimately have to decide who was right, Ozpin or Salem. Personally I was on Salem’s side. While the power did start to go to her head, she still stayed very sane and reasonable during that stretch. Ozpin is the one who decided to pretend that he was on her side only to try running away with their kids. If he had actually tried to talk to Salem face to face then I think they would have been okay. He’s the one who was very unreasonable here. Ozpin is pretty content to work with the gods even though they’re the ones who messed up Salem in the first place and appear to be rather malicious. They did come close to ending the human race after all. You now have to question Ozpin’s decision to gather all of the relics as doing so will just bring the gods back to murder them all. Meanwhile it’s hard to say why Salem wants them. I’m hoping she is planning on attacking the gods or something which would be pretty cool. It’s too early to guess at the exact goals right now, but I’m definitely rooting for Salem to take down her rival once and for all. Meanwhile this may be Ruby’s best volume yet. She’s really gotten used to her leadership role and this is the first time where we actually see her giving out orders. She’s stepped out from Qrow’s shadow and her character arc appears to be complete. She’s close to mastering her silver eyes as well which is good. Weiss gets the least development from the 4 in this volume but she already had a lot in 4/5 and it looks like 7 will be another big one for her so that makes sense. Blake and Yang get their closure with the Adam plot so that was important. Yang is effectively over her trauma now and Blake’s resolve to never run away again is confirmed. She’s definitely come a long way. 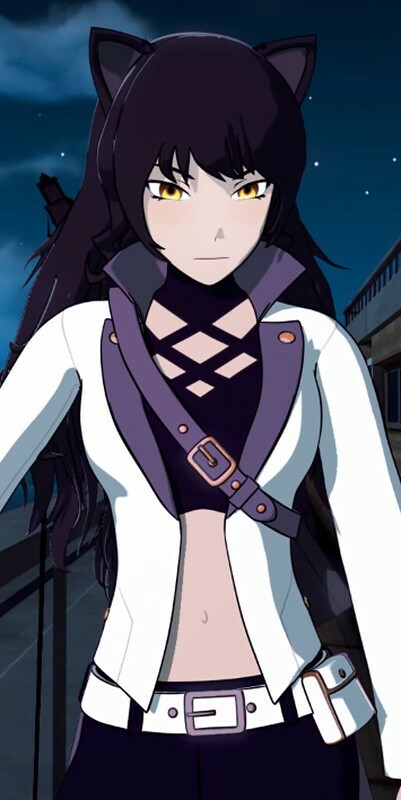 While Blake is still my least favorite of the main 4, she could possibly pass Ruby for 3rd at some point. It was just her bad luck that this would also be such a great volume for the group’s leader. For characters who didn’t look so good, we’ve got Oscar and Qrow. Qrow spends most of the volume whining and really not looking like the reliable guy you can count on. His abilities also don’t seem nearly as impressive as they once were. He feels like he would be on an even playing field with the main 4 rather than being a large step above. After the Grim Reaper said that Yang has surpassed her as well, it really shows that the grown ups just can’t keep up. Meanwhile Oscar is annoying as he takes things super personally and then vanishes in the middle of the night to do some shopping. There still doesn’t feel like there is much point to his character. Take Oscar away and the series really wouldn’t change to be honest. Back to the Grim Reaper for a second. While I’m not a big fan of her, I did really like the flashback sequence we got where she fights off a group of bandits. Her fighting style is a lot of fun and it’s certainly nice to finally see another silver eyed warrior. She did get a little outshined by the shark tooth girl but that made the whole thing even better. While brief, the two can definitely be considered to be some of the stronger characters in the series. Salem’s main minions don’t get a lot to do here, but we do have some scenes to explore what Mercury and Emerald think about the whole situation. It’ll be interesting to see what they do from here. Mercury’s days of hype do seem to be gone now though so his next fight will probably be his last. I could see Emerald having more to do, but I wouldn’t be surprised if Salem or Cinder ends her. Either way I don’t see her escaping alive. Tyrian, Watts, and Hazel don’t do much of anything, but we should at least get to see the first two fight in the next volume. There’s not too much to say about Team Jaune. Nora and Ren still feel extremely weak and desperately need some kind of power up to make them relevant again. Jaune is basically holding the team together at this point and hopefully he has something up his sleeve for when the team fights their next opponent. If he can use his aura amplification to do something with his sword then he has got a lot of potential there. I do think this volume felt a little too short though. While the episodes started out rather long like with the Salem adventure, the final episodes were all extremely short. Perhaps not more so than previous volumes, but with the increased budget and mainstream attention I’d like it if we could get more full length adventures. I’m assuming Gen-Lock took a lot of time out from RWBY, but hopefully for next season we’ll get more footage. After all, we lost a whole episode here to limbo. (Gen-Lock looks fun of course, but not in the same league as RWBY so I still want Rooster Teeth to give this title the bulk of its attention) Also, the big Kaiju didn’t make for a great final boss. He ultimately went down in a single hit after he was frozen which doesn’t make for the most intense final boss. I think shifting it so that the Adam scene was the final part of the climax would have worked a little better. I don’t see Adam returning, but with the way the scene went it’s definitely possible as a shock value twist. Finally, we got the big return of Neo here. It’s been a very long time since she last appeared so I’m glad to see her return. The scene was handled perfectly as her theme music is one of the best in the series. It amplifies the hype a lot more than if the scene had no music. Her fight with Cinder also reminds you just how good she is. Without Cinder’s Maiden abilities she certainly would have lost so it’s fair to say that Neo is high tier and can probably take on just about any non-maiden. 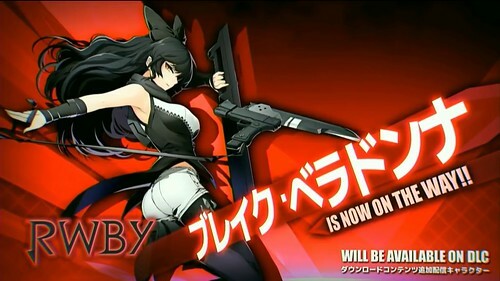 We’ll see if she ends up being a little nerfed or something, but otherwise her partnership with Cinder is probably enough to take down team RWBY+Qrow+Team Jaune+Oscar I’d say. Of course with a large scale battle like that it is possible that teamwork will make all the difference. Also it’s unlikely that such a fight will happen since we have so many other parties running around like Salem’s group and the Atlas fighters. As for the after credits scene, it’s pretty weak to be honest. Salem is making more Grimm…that doesn’t seem like a threat though. By definition Silver Eyes eradicate Grimm with no exceptions. We found out that the ability is straight from the light god so I don’t think Salem could override that. Most likely they will serve as a diversion or something to keep the military busy or Ruby’s friends. Still, I feel like if they go up against any named character they would just be fodder. It makes sense to have a Grim invasion for pure numbers of course, but it shouldn’t have been the big cliffhanger scene. Overall, RWBY is in great hands as always. I have high hopes for volume 7 as expected and it’ll still be tough to beat this volume. Still, with all of the characters in motion there is definitely a real chance that it could be the best volume yet. We should be getting a ton of action scenes there so I’m glad that the crew has confirmed that they are already working on the next volume. The more development time on that the better and you can never start too soon. If you haven’t started RWBY yet then I recommend binge watching the whole series and fixing that ASAP. It’s no exaggeration to say that this is the greatest TV show of all time. I forgot to add this one a few days ago. 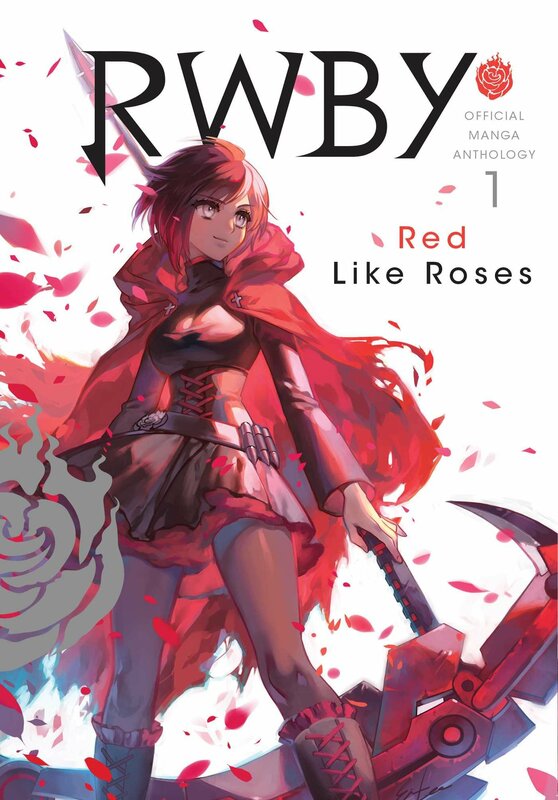 So, RWBY finally has a manga that is going to re-adapt the show while adding a few twists and turns which is an awesome concept. We’re pretty early on in Volume 1 right now, but I’m interested to see how this is going to go. An ongoing RWBY manga is something we have always needed. I’ll have a review up when the series finishes, but I don’t see that happening anytime soon. 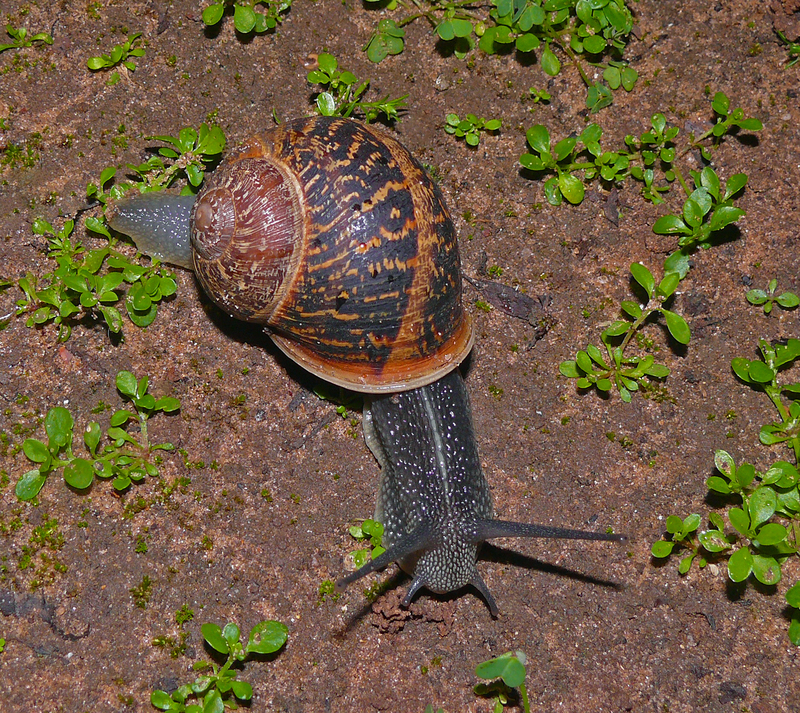 Suggested by Destroyer A Snail is one of those creatures who doesn’t appear to be all that formidable at first glance. The thing is, this doesn’t change in the 2nd or third glance either because a Snail just isn’t very tough. They crawl around with passion but don’t have a whole lot of attacks at their disposal. I think it would be a simple matter for Blake to just trap him in a jar. Blake wins. Suggested by Destroyer Blake hasn’t had a big fight in a while to show off her true power, but we know that she is still far ahead of Percy. Her speed was enough to help Adam take down an army of robots and in the tournament she performed well with the other members of team RWBY. I’m afraid that Percy will be getting speedblitzed for the entire match. The poor guy just doesn’t stand a chance. Blake wins. Suggested by Destroyer Blake is a very strong Huntress and she will definitely be able to take the win here. Her shadow clones come in many different elements and if the rock one trapped Bart he would be unable to break free. Such a feat would take far more strength than he currently possesses. 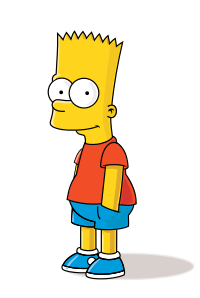 Bart may have lost this round, but he shall be back someday. Blake wins. All right, it’s time for another RWBY list. The series has had a lot of quality action scenes throughout and that’s what has gotten the series so popular in the first place. It’s also pretty well balanced as every volume has been able to deliver a fight worthy of this list. This list isn’t quite as hard to create as picking the best characters but it’s still not easy either. Here are a few quick shoutouts to some of the fights that nearly made the list. The Food fight back in volume 2 was definitely a lot of fun. It was a friendly exhibition between team RWBY and JNPR but both teams really gave it their all and the choreography was on point. We have never gotten to see the 2 teams fight before and at this point it is unlikely that we ever will so this was the closest thing to such a team fight. Another pair of shoutouts have to go to the 2 train fights that didn’t make it on the list. 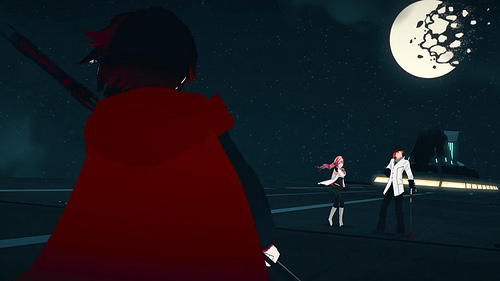 Blake vs Torchwick and Weiss vs the White Fang lieutenant. While the former fight was quite solid it was short and naturally less impressive than the season 1 fight. The Weiss fight was great and certainly delivered with a lot of quality visuals but it was just edged out by a few more fights. This one would fight with the Vernal fight as a close runner up. 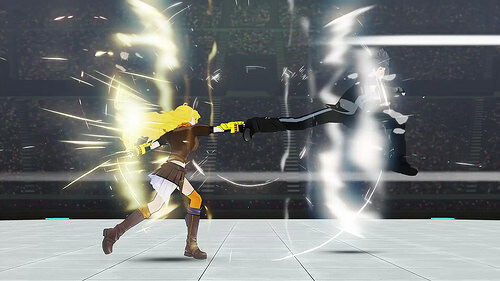 I also liked Yang’s battle against the two dancers in her trailer, but the fight was super short. All right, let’s launch into the list! 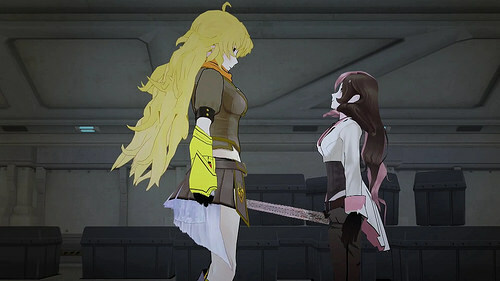 After seeing Neo completely wreck Yang back in season 2 I think it’s safe to say that everyone was looking forward to Neo’s next big fight. Well it finally happened here and as expected she had the upper hand. It is a little hard to say how well Ruby would really do against her since the fight was 1 vs 2, but Neo seemed to have the lead regardless. It’s a really solid fight that shows off the villains teamwork. The intense music in the background serves to amp it up even more. How could the final fight of Season 3 not make it? Pyrrha put up a really good fight considering that Cinder had ascended to be one of the 4 Maidens by this point. Her magnetic abilities are put to good use here and the fight has a lot of shockwave effects to emphasize how much power both of these fighters have. Even once you think Pyrrha is down for the count she manages to get one last hit in. A shame that her opponent was simply on another level. We’ve seen teamwork from the villains so it’s time to look at the reverse. 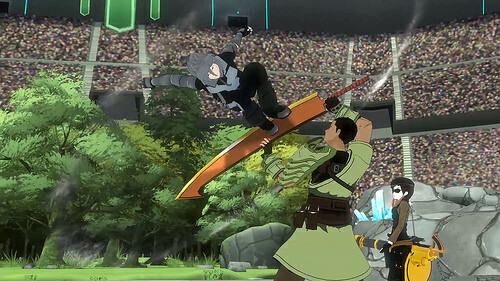 Team RWBY utilizes a flurry of combo moves in this match and it’s nice to see since during the timeskip between seasons 1 and 2 it’s expected that they would have had a lot of time to train. Each member is a lot more experienced now than they were before. 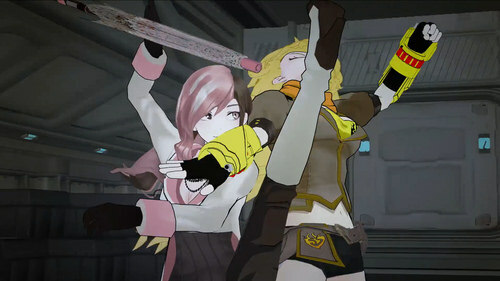 We also got Yang’s cool “Die” song along with the best showing of her semblance in the whole series. Torchwick himself doesn’t get to fight much here, but his mech suit was certainly impressive. 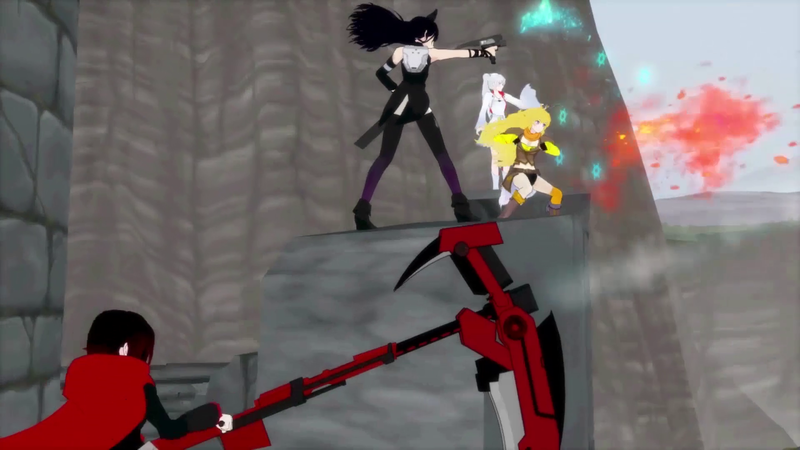 In general this is still the only real time we’ve gotten to see team RWBY fight a powerful opponent. Hopefully we get to see a fight like that in volume 6. This season 1 climax fight was great. For starters we actually got to see Torchwick fight hand to hand and it proved that he wasn’t simply a thug who hides behind his men. We knew that his cane was good from episode 1, but here he was easily crushing Blake and gave Sun an even fight. I don’t think he would have beaten Sun, but the fact that it is a possibility is certainly impressive. The fight is well choreographed and very fast paced. This fight is probably a little underrated since it occurred amidst the plot really starting for the show so you were busy thinking about everything else. 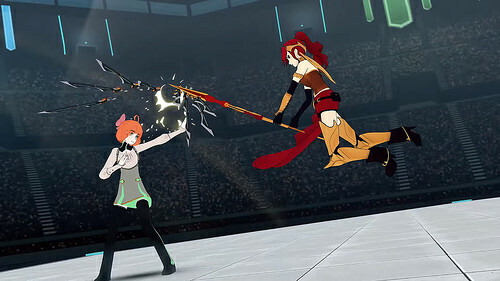 Penny’s manipulation with her swords is very similar to Pyrrha’s magnetism and makes for a fun match up. The music for this fight is really good and it’s just very fast. Both opponents are very skilled, but at the end of the day there is never any doubt as to who would emerge victorious. The Tag Team matches in the tournament were definitely a blast. While the Weiss and Yang match didn’t quite make the list it was also pretty solid. This was the first time we got to see Mercury and Emerald fight for real and they lived up to the hype. 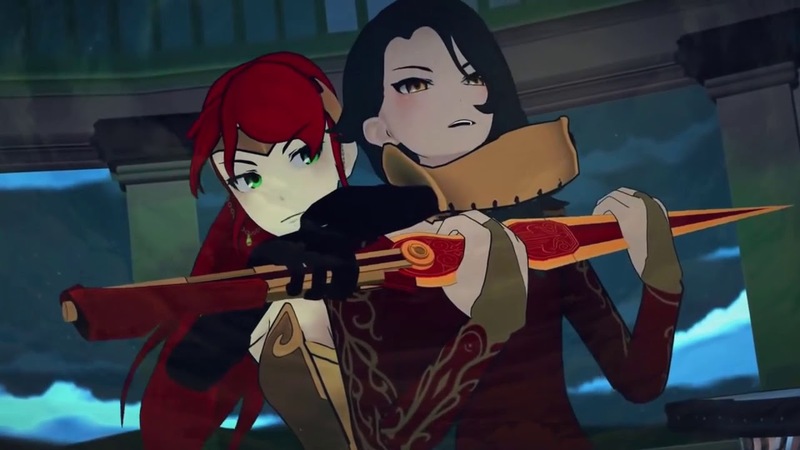 The fact that they won this round so easily shows what a threat they are and it’s why to this day it’s hard to say whether any tag team of RWBY could hold their own against them. Mercury did most of the work in the opening stages and probably could have won in the 1 v 2, but Emerald’s illusions are just as handy. These guys are definitely a force to be reckoned with. This fight is incredibly impressive and shows what a battle of professionals is like. Qrow and Tyrian are clearly fighting at a very high level here. Surprisingly Tyrian seems to have the edge for most of the fight which shows what a threat he is. The scene of Tyrian punching him was awesome since we rarely see a fighter attack without their weapon. The group fight prior to this one was a lot of fun too and this was easily the highlight of season 4. I’m definitely eager to see Tyrian reappear in the next volume. Also hopefully Qrow gets back to this level of power. This fight doesn’t have anything fancy. Neither fighter is using any kind of special energy blast and they aren’t in a volcano or anything. It’s simply a very basic hand to hand fight where both combatant is doing their best to bring the opponent down. That’s part of what makes the fight so impressive as it’s just a really serious battle of skill. Neo is clearly a few steps ahead here and even takes the time to make fun of Yang in the process. Definitely a great way to debut (Not counting cameos) and Raven’s appearance at the end was also pretty hype. For a while this had been my favorite fight and it still holds up incredibly well. The battle music really sets the stage here. As soon as the first punch is thrown the tempo never slows down. Both fighters are absolutely relentless using every attack in their arsenal until the opponent is down. Their fighting styles of hand to hand vs kicks is also a nice contrast. It also helps that I’m a huge fan of both characters! For all the heat the last volume has gotten in terms of avoiding fights, it definitely delivered with this one. While it’s hard to say if it was worth spending almost the entire budget in a single fight, it’s hard to deny the results. We got to see two of the strongest characters in the series duke it out and they weren’t pulling their punches. The strength and speed they exhibited is what you would expect from a Maiden. It was a great way to wrap up volume 5 and it’s also a high bar for all future Maiden fights. I will accept nothing less after seeing how great this fight was. So that’s my Top 10! I look forward to seeing how many fights volume 6 will add to this. RWBY lists never get old, but my next ones/editorials will likely venture out into other franchises so be on the lookout for those! 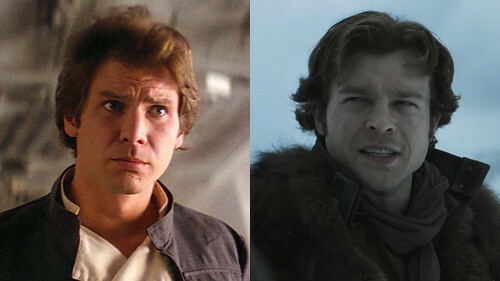 Suggested by Destroyer Han Solo may be one of the bravest pilots on the block but that’s really not enough to deal with an opponent as quick and strong as Blake. Blake has her element clones at the ready and destroying one risks getting the attacker injured in the process. Blake is also quite fast and strong so she will be able to dodge Han’s shots and deliver the knockout blow. Blake wins. It’s time to take a look at the greatest TV show of all time. For a long while Yugioh GX held that spot and I never thought that it would be surpassed or even that it could. Then one day I happened to notice the twitch marathon channel tuning into RWBY. They were in season 2 and I saw the hype battle between team RWBY and Torchwick. I stuck around for about 4 episodes before deciding this was a show that I needed to watch and so I went back to the beginning and marathoned it. I’ve since seen most of the episodes 3 times thanks to various reaction videos and the fights more times than that. It’s certainly a title that I imagine will stay in 1st for a very long time. There are 5 volumes so let’s go through them all from the beginning. The premise of the series is that the planet has been overrun by the Grimm. These are shadow creatures who destroy at random and thanks to their sheer numbers humanity has had a very hard time dealing with them. Fortunately they found out how to harness aura. Aura allows you to shield yourself from injury and also lets you augment your attacks. 4 kingdoms arose and various little villages sprang up as well although those tend to be destroyed by bandits or Grimm monsters. The people who fight back against the Grimm and defend our borders are known as Huntsman. They are our last defense. 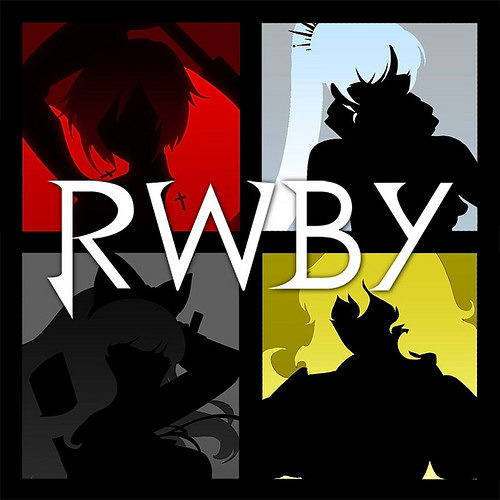 The series focuses on team RWBY who are comprised of Ruby Rose, Weiss Schnee, Blake Belladonna, and Yang Xiao Long. They don’t actually form until midway through the season though. The first volume is mainly set up with the heroes having their first real confrontation with the enemy near the end of the volume. It’s definitely a really fun volume and one that has aged pretty well. It got the ball rolling for the series after all and did a good job with everyone’s personalities. I should also mention that part of how the series built up a lot of hype before even airing was through the 4 character shorts they released before the series even started. Each of the main 4 characters got their own and the shorts were all about the action. If we count them as episodes then they are all likely still in the top half for me. All 4 of them are excellent but if I had to pick a favorite then it would be the Yang special. It’s the longest which leads to the most action, but she is also the most enjoyable character of the 4. You may have expected the show to be a little different than it was if you saw the 4 shorts and then went into the show, but ultimately the fights do come so it’s not as if they were cut off entirely. It was a wise move to make the shorts about the fights as a glimpse of what was to come. Volume 1’s soundtrack is also amazing and some of the best tunes in the series are in this volume like the theme song. This Will Be The Day is a song that I have heard well over 100 times at this point and it certainly never gets old. It’s very fast paced and gets you psyched up. Then we also have Red Like Roses II and even just the normal instrumental tunes that show up. The animation was pretty simple and not too detailed here, but it really showed up whenever an action scene would pop up. It’s a really balanced volume. Next up was Volume 2. Now that the heroes had scored their first win against the villains they were ready to try again. The first half of the season follows their attempts to shut Torchwick and his cronies for good. We also start to get some set up towards events in season 3 like the villains big move and the tournament. They also squeeze in a school dance and even an invasion. Season 2 throws in a bunch of new characters and has a lot of fights so it’s definitely the logical next step from volume 1. It’s essentially better in every way which is always how you want a show to be. It should get better with each season. The animation has noticeably improved from season 1 as everything just looks more modern. This translates really well into the fight scenes as well. We get some of the best fights in the series here like Yang vs Neo or the team against Torchwick. Each half of the season has a nice climax and there are no bad episodes here. Well, the whole series has never had a bad episode so that goes without saying. We got some new tunes to write home about here as well like the great opening, Die, and Sacrifice. Little did I know that the series would get even better. Season 3 is the absolute peak for RWBY and a major part of why it is the best show. The tournament finally starts up and lasts for the majority of the season. Then the villains finally make their big move which leads to a lot of fights. Almost every big character who was referenced or introduced earlier gets to have a nice role here as well. The episodes also start to get longer in this season which is good since the ongoing plot starts to take root here. We are introduced to the concept of the 4 maidens and the relics which is what the rest of the series will likely be about. At the very least the next 2 volumes are about this plot and it stands to reason that volume 6 will follow suit. The animation is at its best here for the fights as my personal favorite match happens. (Yang vs Mercury) Divide is really a highlight song for this volume as well and it works perfectly for the end credits. The climax of volume 3 is also the most ambitious yet as we finally get to see what some high level fights look like. By high level I’m not necessarily referring to animation as they’re all high level up to this point, but in universe what some of the stronger fighters can do. Then we move on to volume 4 which definitely gets pretty interesting for the series. Unfortunately I’d say that this is around the same where the series got really mainstream. This one decided to go for an even more plot based approach with minimal action. The animation style was also completely overhauled and so we lost 2/3 of what made the original seasons so amazing. We still did keep the solid soundtrack though and while we lost the pacing, things do get intense when they finally happen. Volume 4 is easily the weakest season for me, but theoretically it is meant to help Volume 5 be even better since the whole volume is set up. Volume 4 isn’t completely devoid of fights either. We get Qrow vs Tyrian which is known as one of the best fights in the series and I would absolutely agree with the consensus. Then there is also the season finale fight against the Nuckle which isn’t a personal favorite of mine, but it is certainly a fight. I’d say that the season had 4 real fights which isn’t half bad. The actual animation does look sharp so it’s not as if the overhaul was a strict downgrade. On the contrary, the character models are on point. Everyone basically looks the same except for Ruby and now they’re in HD. The real problems with the animation is the facts that the animators don’t seem to know how to use it. There were a lot of behind the scene issues here and I also suspect that the show was trying to nerf all of the characters a bit to mask their animation inexperience. The characters go from being incredibly fast powerhouses who felt like DBZ characters to suddenly being very mortal. Their attacks lack any actual impact anymore and they seem to have trouble with monsters that wouldn’t have stood a chance back in the day. As big a deal as it was in volume 4, I’m afraid that these issues would rear their head even more in volume 5. 4 also made sure to cram in as much exposition as possible to the point where it would take them 5 minutes to say something that you would figure out in 1. This may be my least favorite volume, but it’s still good on its own. It would probably just be a 7 as opposed to a 9 much less a 10. As far as the soundtrack goes we were introduced to Qrow’s new theme which is definitely very solid and Yang’s theme from the end credits which still ranks as my favorite song. A close second is the first volume’s intro with Divide being third. This is the End could end up passing those once the full version is released though. I also liked Weiss’ song “This Life Is Mine” which was another standout hit. The franchise has never had a season go by without some new epic songs. Then we have volume 5. Here we finally get the big payoff as the heroes and villains have their first confrontation since volume 3. The battle for the next kingdom finally begins and we have our first Maiden battle. Naturally the big hype for this volume is that team RWBY is finally together. Maybe that’s another area that hurt the last volume. Seeing Mercury and Emerald get to fight again was pretty fun as well and as a whole the volume was just a lot more epic than the last one. If we had the same level of fight quality as volume 3 then 5 would have had a real shot at being the best. The problem here is that the lack of fights is even more glaring than in volume 4 and likewise with the nerfs. Everyone seems to fight in slow motion for the most part. 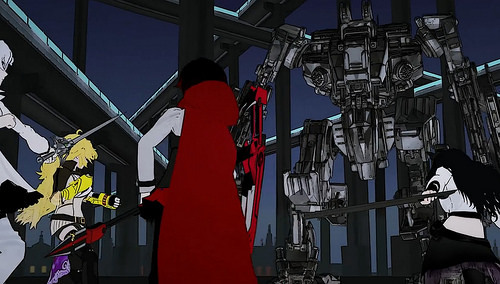 Compare Yang’s fight against the bandits to her fight against the gang members in the original Yellow trailer. The volume 5 fight just doesn’t look impressive at all. The choreography may look nice, but there’s nothing impressive about how quickly she is taking them down. In the time it takes her to beat one guy she has probably steam rolled 2-3 in the yellow trailer with a flurry of more powerful blows. This may have all been to make the Maidens look more impressive. I heard that the big fight at the end took 6 months to animate. I am really hoping that this isn’t true. While it does give a concrete reason for why the fights have come to a halt in the later volumes, it would just be a bad sign for future seasons. We need every fight to look like the final one, not just one per volume. I also do have to admit that volume 5 wrecked the climax. “The More The Merrier” is definitely one of my favorite episodes in the franchise as it perfectly set up all of the fights. Yang vs Mercury, Qrow vs Raven, Ruby vs Weiss, etc. When the episode ended we even got a conclusion to one of the fights so you expect the rest to continue. The problem is that they don’t. None of the fights ever actually happen as it cuts away every time and we just see the aftermath. It doesn’t even make sense half the time as in one scene the heroes are basically out of energy and getting obliterated and in the next cut it is the exact opposite. The power levels also got quite wonky by the end and the way Raven’s plot ended in volume 5 was actually terrible. Volume 5 was still a lot of fun regardless and it was certainly hype, but it could have ended on a much better note. The soundtrack was great as always though. I did enjoy the new opening quite a lot and the song for Raven vs Cinder is definitely one of the best in the series. 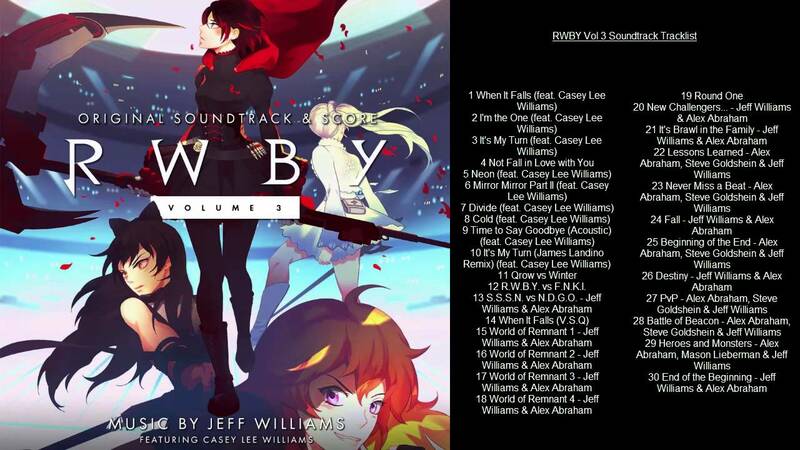 I think volume 5 may have introduced the largest amount of epic tunes out of all the volumes since we also got From Shadows Part II and the theme from Yang’s new trailer. Raven vs Cinder is also one of the best fights in the series so it shows that the animation is still on point. Volume 5 has a lot of replay value and you can definitely see the episodes quite a few times. All right, it’s time for the bulk of the review which is looking at the large cast in the series. Brace yourself as I will talk about almost every character who had a reasonably large role or has survived and thrived as a meme like Pilot Boi. Naturally we should start off with the main character Ruby. From the first trailer you may have expected her to be a very intense character of few words who viciously finishes off her opponents, but she’s actually rather timid and mild mannered around others at first. This doesn’t apply when she is fighting off villains though as she eagerly jumps into battle in episode one against Torchwick and his cronies. That scene alone had me convinced that she would be a great character. She doesn’t back off when bickering with Weiss and always does her best to help everyone out. 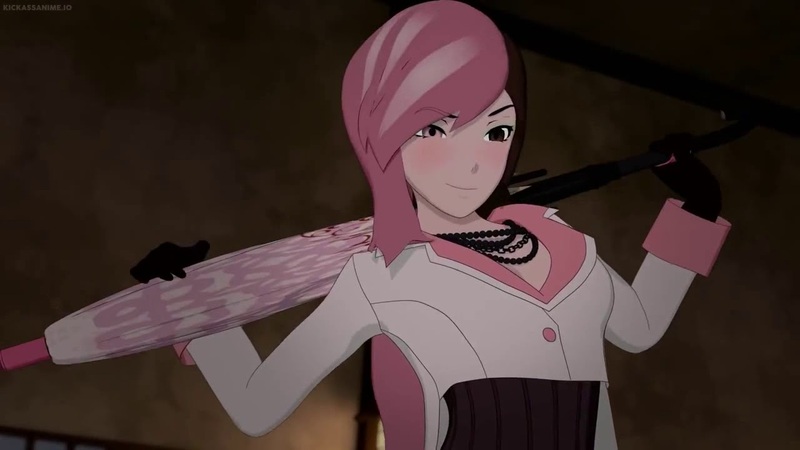 She didn’t blame Pyrrha for what happened to Penny which is good since that would have been an annoying plot and she put up a great fight against Neo and Torchwick. At the end of the day she is also a smart tactician and that is really what makes her a dangerous fighter. Once she finally masters her white eyes then she could be the strongest in the series or at least top 5. Next up is Yang who is the best character of the four. She can turn Super Saiyan when taking damage and tends to have the best themes as well. Yang has always been known as the power hitter of the group and tends to be trusted to take on the strongest opponents. 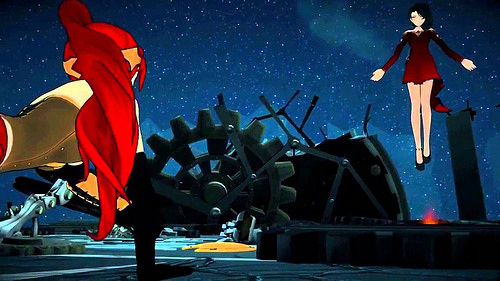 In volume 2 she is left to face off against Neo while she takes on Mercury in volume 3. While she isn’t quite the strongest character in the series, I’d say that she is definitely the most powerful student. She wasn’t able to train much during volume 4 and it’s unknown if her robot arm will be as good as her old one (I’m inclined to say that it isn’t as good) but it’s safe to say that she has retained her rank among the other fighters. Yang didn’t look good during volume 4 with her depression subplot but by volume 5 she is over it and finally back into the fight. I’m looking forward to seeing her get some more fight scenes as Yang is still my favorite hero in the series and 3rd favorite character overall. 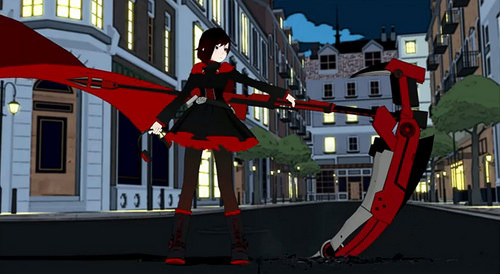 Weiss was Ruby’s rival for a little while and definitely was the meanest of the group. It basically comes with the territory of being rich and gifted with immense power. She eventually learns how to be a team player though and probably has the best synergy with Ruby. They tend to pull off some really good combo attacks like the one against the Nevermore or their overall strategy against Torchwick’s robot. She has transformed from a close range fighter to more of a long range summoning specialist over the course of the volumes. We haven’t gotten to see Weiss fight all that much compared to the others, but it’s fair to say that she has the potential to be the strongest member. Her elemental abilities and glyphs already make her a dangerous opponent so throwing in the summons makes her a fighter who can be lethal at any range. I’m still a little upset that she was defeated so handily against Vernal, but since she wasn’t really able to practice or spar at all for a very long time, I can buy into the excuse that she was rusty and out of practice. All of team RWBY (minus Ruby) have had really extensive character arcs so it’s a little bold to say that Weiss has had the most development out of all of them but a case can be made in her defense. Either way she is definitely a great character and the 2nd best member of Team RWBY. Finally we have Blake. She’s probably dealt with the most issues out of the team as she had a tough childhood and basically now has to assume command of an army at a young age. As she is a Faunus she has superhuman levels of ability but at the same time she has to deal with all of the social stigmas of being part animal. Blake is my least favorite member of the cast since she ditched everyone to run away from the villains in order to save herself. Sun eventually talked her out of it, but I was never really able to get around that. I can understand why Yang was so upset at her even if the two eventually made up. Hopefully that’s the end of that plot so in volume 6 we can skip ahead to the epic fights. Blake was hit with the nerf hammer the hardest though along with everyone in her plot like Adam but more on that later. I think what hurt Blake a little as well was her incredibly long subplot that took up a big chunk of seasons 4 and 5 with a bunch of characters that I didn’t care about either. She’s a good character overall, but was definitely at her best in volume 2 if you ask me as she desperately kept searching the city to destroy Torchwick. She had a tangible goal there and really worked to get to it. Here she now has an army and can cross large distances in impossible times to help foil an invasion but she still doesn’t seem to have the same drive and intensity that she used to have. Now if she could get a little stronger for volume 6 that could help her. It will be very tough to pass any of the other 3, but that’s not really a bad thing since they are all very solid characters. Someone has to be last after all. We looked at team RWBY so now it’s time to look at JNPR. Pyrrha may not have been the leader of the team, but she was their best fighter so I’ll discuss her character first. For many series there is a character that I place as my favorite before properly watching the series like Gaara in Naruto, Piccolo in DBZ, etc. Pyrrha was the character that I chose in RWBY and while she did get surpassed by quite a few characters she is still certainly one of the best ones. Her fighting abilities are on such a high level that she was considered to be a prodigy. Pyrrha is also one of the nicest characters in the series and tries to defend Jaune when people make fun of him. Her big fight at the end was great and she never really had a bad moment in the series. It’s just a shame that she couldn’t have appeared more than she had. Then we’ve got Jaune who is basically the polar opposite of Pyrrha. He isn’t particularly talented at anything and as a fighter he is one of the worst in the series. He isn’t very fast or strong and is basically a human fighting among heroes. Surprisingly he has yet to get a power up at the moment, but as a result he also wasn’t nerfed when everyone else was so that has helped him close the gap a bit. His speed now seems to be on roughly the same level as everyone else. He does have a healing ability in his back pocket which is sure to be helpful as well. He was a really solid comic relief character for the first 3 volumes. Now he is more of a quiet rage character who blows up when the villains appear. He definitely works well in both roles but he desperately needs a power up at some point. Nora and Ren had a high bar to get over since Jaune and Pyrrha were so solid. They never quite make it up there, but they aren’t bad characters. I guess they just don’t add much to the story. Nora is always fairly cheerful and is low key known as one of the stronger fighters in the school. She has a lot of raw power at any rate and while she doesn’t tend to take anything too seriously she does know when to turn the comedy switch off when necessary. I do think she is basically irrelevant at this point as far as the power levels are concerned, but her fans will be happy that she gets her moment in volume 5. Then we have Ren who suffers from the same issues as Nora. In his case he isn’t the super cheerful character, but the quiet one. As a result he tends to be a little slow on the uptake and gives the characters obvious exposition or just acts as a nuisance. His past traumatized him quite a bit so he was ready to desert Ruby and Jaune just to get out of the area. Later on he gives a big speech on what the meaning of character development is. Maybe if Ren gets more screen time that isn’t him just talking that would help as he had some potential when he briefly fought against Tyrian. In theory he has more proper hand to hand training and warrior skills than some of the other characters, but it never seems to be all that important. He’s not my kind of character, but he’s not bad. It’s time to look at the first big villain of the series, Torchwick. Torchwick is a great villain and certainly one of the best ones. He manages to balance out his sarcastic humor with his more intense scenes to become the great villain that he is today. Considering that he seems to be a normal crook with no aura or anything, it’s actually very impressive how well he fights. He was holding his own against Blake and Sun. Later on he was even giving Ruby a good run for her money. He’s definitely a villain who steals the show during every appearance that he is in and Torchwick will not be forgotten. Neo was Torchwick’s right hand woman and she is definitely one of the strongest villains. 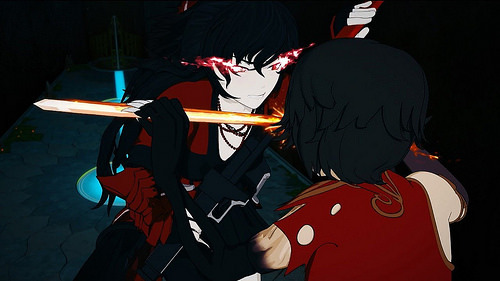 She defeated Yang with absolute ease as she was just toying with the hero during the whole confrontation. After that she went on to overwhelm Ruby in their fight although it wasn’t as one sided as you would expect. Perhaps Ruby’s fighting style would be tougher to counter since she isn’t a hand to hand combatant, but the fight was too brief to really speculate on all that much. 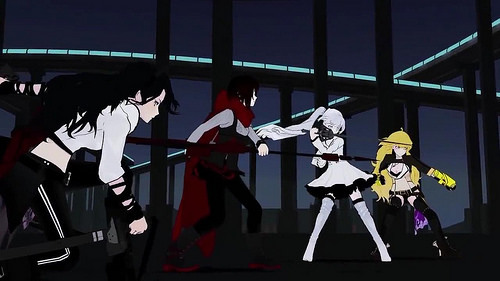 The show actually did a good job of balancing Team RWBY for a while there as they were all about equal overall but with different fighting styles so the matchups were very important. Despite being one of the best villains as well as one of the most powerful Neo surprisingly hasn’t done all that much in the series. She’s had 2 fights and that has been it. Hopefully she will return in volume 6. Salem is the big bad. She’s the leader of the villain organization but hasn’t gotten to fight yet. She talks tough in the background though and it can be very reasonably inferred that her abilities are considerable. Honestly I find it hard to believe that she can keep up with some of the faster opponents while in that cloak and she always walks around as if she is very old. These can all just be red herrings though and I expect big things for when she actually fights. Salem’s definitely a very good leader for the villains though as her design and voice are perfect for the character. She feels about as intimidating as the embodiment of darkness should be. Cinder isn’t the leader of the villains, but she is the figure head. She carries out all of Salem’s orders and is the face of the villains to the general populace. Her plans started very early on in the first volume even as we slowly learned the chain of command. She was a considerable fighter from the start and only grew stronger once she obtained the Maiden abilities. It’s easy to see why she is a fan favorite and I definitely like Cinder a lot as well. She is powerful and intelligent which is the ultimate combo as a villain. She even outsmarted Raven even if she wasn’t quite as powerful in the end. If her character arc has finally ended then it was still a very satisfying adventure. That being said, I would certainly like for her to return so we can get some more Maiden battles. Mercury is a really great villain who is certainly one of my favorites. Honestly the villain ranks are stacked with awesome characters like him, Neo, Torchwick, Emerald, Cinder, and Adam. So…pretty much all of the main villains from the early part of the series. Mercury actually ranks above all of them as my number 1 favorite character in the series. It’s hard to say exactly when that happened, but I just love that smug arrogance that he has. He looks and sounds like Sasuke as well which fits the character. It’s hard to say exactly how strong he is since he threw the fight with Yang, but at the very least he is quite high tier. 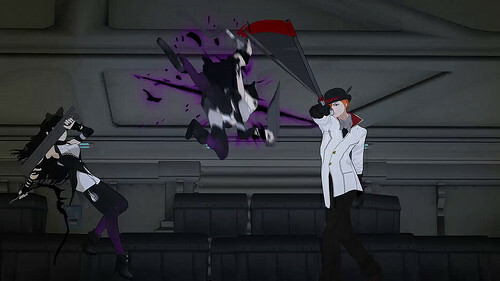 It’s hard to say at this point if he is still stronger than each of the members of Team RWBY, but I’m inclined to say that they haven’t quite caught up to him. I feel like his role in the story is almost over though so hopefully he at least gets one more fight. Emerald is Mercury’s partner and definitely doesn’t seem to like working with him all that much. They’ve been teaming up for quite a while though and usually have some fun banter going back and forth. What makes Emerald really shine is that she’s not only a great villain, but also performs very well as a fake hero. She’s really over the top with how cheerful she can be and would fit right in with the heroes if it wasn’t an act. Her illusion abilities are very hard to deal with and her close combat skills are also top notch. I’m definitely looking forward to seeing her fight again. Pilot Boi got to appear for a cameo in volume 4, but didn’t really get huge til volume 5. He was voted as the greatest RWBY character in the Reddit poll and I can definitely sympathize with them. He’s an incredible character and to say that he is just a meme would be doing the character a great disservice. Every line uttered by the Pilot Boi is gritty and to the point, but not in a bad way. He just lays out the facts honestly. He only cares about himself and his money so everything else isn’t his concern. Even Weiss knows better than to mess with the guy. There are a lot of fans who hope he survived the crash and I do as well. He needs to return and to get an action scene to prove that he is more than just a fad. Just listen to his lines and you’ll see why he is such an iconic character. Then we’ve got Ozpin who is the head of the school and later inhabits the body of Oscar Pine. He is always very shady and likes to keep a lot of secrets. We’ve certainly seen this kind of character many times before and I’m typically not a fan. He is no exception either. Ozpin doesn’t think anything through. The whole point of the school he built was to defend the Relic that was hidden there from Salem by essentially having an army of powerful students there at all times. The problem is that he didn’t tell them about this or even how to fight since they all tries to run away when the villains showed up. He doesn’t tell Ruby how to use her powers and doesn’t even tell his teammates when they are heading into a trap. He is definitely a “The ends justify the means” character who would fit right in with the villains. He can’t be trusted if you ask me. Oscart is an interesting character as I thought his name was Oscar, but the credits of volume 5 corrected me. I guess I’ll spell it the easier way anyway though. He’s a rather annoying character for many reasons. One of those reasons is that he doesn’t know anything so the show has to waste time explaining basic concepts to him like aura and how to fight. He has never trained before, but suddenly he is on the level of the other heroes thanks to Ozpin hax? I don’t like that one bit and he does quite a bit of whining and panicking throughout the show. He never develops into a good character and it’s taking him way too long as it is. Hopefully he is better for volume 6 as right now he just exists to make the power levels wonky and to be the Chris (Sonic X) of RWBY. Winter is Weiss’ older sister and a very accomplished fighter. She has had a very minimal amount of screen time so far, but has still managed to become quite the fan favorite character over the years. Her fight with Qrow was very impressive and I would like to see her fight more in the next volume. Like Weiss she has quite a lot of confidence. Having her around to teach Weiss more would be good and she is just a solid character to have around. She will also help to keep Qrow in line and her presence would force him not to slack off. After all Qrow was clearly losing his touch in volume 5 as he got humiliated by Hazel. He looked so terrible in the whole volume that I have to wonder what the writers were thinking. Qrow is a very powerful huntsman who is fast and strong. He was able to compete with Tyrian after all. How is he too weak to even injure Hazel? 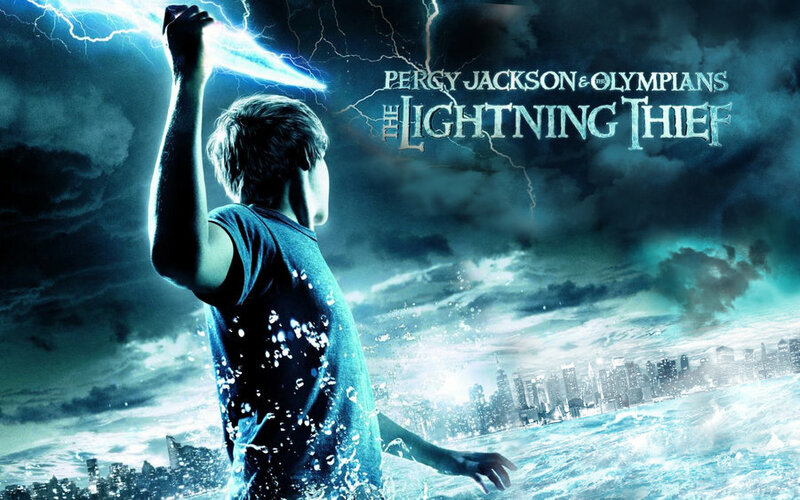 His sword should absolutely leave a dent and then he is also too slow to dodge any of Hazel’s attacks either. Their mini spars were always just annoying and it’s been tough for Qrow. Don’t worry, he’s still a pretty awesome character though. His first scenes are still classic as he is always drinking and insulting everyone. He’s quite smug and knows how strong he is. Volume 3 was certainly his best volume. Next to Cinder, Tyrian is probably the most impressive of the enemy fighters. I would like to see him go up against Neo, but at the moment I would give him the edge in a fight. He’s definitely a very psychotic villain as he laughs a lot and certainly enjoys inflicting pain. His fight in volume 4 was really good and you have to appreciate how he likes to skip the talking and go right into the action. He’s vicious as you would expect a villain to be and from the cabal he is definitely the best member. Lets contrast that with Hazel who is the worst one. He wasn’t necessarily a bad villain during his early phase as he always talked with a soft voice and didn’t like violence. Then we learn about his sob story where his sister died and suddenly he turns into the Hulk with a mechanical edge to his voice. As soon as he became super bulky and slow I knew that he didn’t stand a chance here. Not only is his reasoning quite poor since it makes no sense, but turning him into the “strong but not smart” trope is never a good idea. Even his ability to block out pain isn’t a very useful one to have if you ask me as it can serve as more of a liability than anything else. Back to the heroes we have Penny who is an android with super strength. She befriends Ruby and the gang and is also a pretty nice character. She can be a little naive being a robot and all though which doesn’t quite help her to rank with the other characters. Still, she pulls out all of the stops when it comes to the fights though and her battle with Pyrrha was also quite impressive. She may not have done a whole lot during the series but was a nice character to have around. Raven is definitely one of the best villains in the series. It’s fair to call her a villain since she does murder a bunch of innocents even if I wasn’t too consistent in counting her as one during the review. She doesn’t really get to do anything until volume 5, but stopping Neo in her tracks just by appearing was a great way to debut. She looked terrific in volume 5 as she won every fight that she took part in and may very well be the strongest character in the series at the moment. Her ability to teleport is definitely a very potent one. Giving up the relic still makes absolutely no sense, and Raven’s plan to deal with Cinder was bad as well, but she’s still a great character. Raven may not be a great tactician, but she is a superb character and that’s what counts. She could potentially be top 5 as well, but there are probably 10 characters who are top 5 material which is why it gets tough. Adam is another one of those characters and he looked great in the first volumes. He appeared to be a hype rival type character in the Black trailer and then ended season 2 on the most epic note possible. In season 3 he looked spectacular with how easily he defeated Yang and Blake. In Volume 5 I liked his new costume, but that was about it. He went from being Maiden level to going down to a single blow from Blake. It’s really hard to get back up from such a disgraceful performance. No matter, either way he is still a personal favorite character of mine and I would still say that he is one of the strongest in the series. You just have to ignore the plot armor/convenience of many moments during the V5 climax. Vernal is one of the newest characters to show up, but she has already become quite solid. 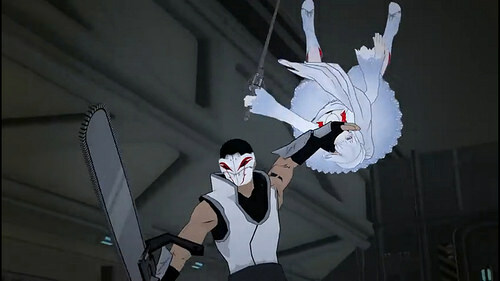 I gained a lot of respect for her during the fight scene with Weiss. Her choice of weapon is definitely quite good as it is basically a Tron disc like the one Tyrian uses. It can also shoot out laser blasts which is really handy. Her skills are the real deal for sure and I would like to see more of her in action although that doesn’t look likely at all. Her role may not have been huge, but it was memorable. It’s time to look at the characters from Blake’s plot. First up is Sun who is the best of these characters. His best role was certainly in season 1 as he decided to help Blake out by fighting Torchwick. Right from the start he was a loyal partner to have at the ready. The romance angle started getting played up a little more in future seasons which wasn’t great, but at least he is always a solid character. He still seems to be quite a bit stronger than her and it’s impressive that he’s managed to keep up so well. He’s just a very solid character. Then we’ve got Blake’s parents Kali and Ghira. They’re pretty reasonable characters and are much better than Weiss’ parents. They are pretty understanding about Blake’s running away and have totally forgiven her. They do a good job of managing their country and affairs while remaining grounded. Then you have the childhood traitor Ilia who decided to team up with Adam to destroy Blake. Well, you know how I typically don’t forgive traitors. Ilia falls into this same hole as the heroes forgive her almost instantly, but I can’t. She was perfectly willing to destroy everyone and would have done so if she wasn’t stopped. You can’t just shake your head and allow her back into the fold so easily. She’ll have to really prove herself to become a better character. There were also a bunch of random villains in this mini arc who forked for the two fox brothers, but they were all very weak and expendable. One of the hype villains got one shotted by Kali who was holding a tray! That’s when you know that the villain can’t be taken seriously. Finally I’ll mention some of the more minor characters that I almost skipped. We have Glynda who is the first huntsman that we see in the series. Her abilities haven’t really been explained in universe yet, but I’m sure someone has figured them out by now. They seem like transmutation or time alteration, but either way she always looked impressive. That’s why I am hoping we see her fight an actual opponent at some point since surprisingly that hasn’t happened yet. We’ve also got Ironwood who has seen a little more action than her. He seems to be a bit of a Superman figure with how he talks and the design. However, the series is hinting that he could become a bit of a villain as he gets more and more desperate to protect his kingdom. He also has 2 seats on the council and may get corrupt with power. Hopefully it doesn’t come to that, but at the very least I am definitely a fan of his at the moment. Neptune deserves a quick mention, but honestly he never contributed much except towards the dance plot. He’s not a good character honestly and would probably rank as one of the worst in the series. He’s not funny and we don’t need one of those characters who is always flirting in this show. I can see why he was written out so quickly. Oobleck is one of the teachers at Beacon and he has super speed along with a close range fire gun of sorts. It’s a pretty interesting weapon. He’s not a bad character, but never really does all that much as he makes sure to vanish before the real enemies show up. Port is another teacher and he gives some decent life lessons. He can be a little annoying though as his scenes drag on so fortunately he doesn’t appear much. Then we have Taiyang who is Ruby and Yang’s father. He seems like a decent fighter, but he will probably be more impressive when we actually see him get to take on a villain. I’m expecting big things from him since he was on the same team as Raven and Spring. Considering how good a fighter Yang was back in the day I don’t agree with Taiyang’s analysis that she uses her Super Saiyan mode too much, but I guess as long as he snapped her out of her depression I’ll let it slide. Then we’ve got Cardin who was the big bully for season 1. He never really shows up again after that, but he was an entertaining guy. Cardin was certainly clever though and manipulated Jaune and the others like a champ. Flynt was a pretty good fighter from the tournament who actually managed to take down Weiss. His fighting abilities are nothing to scoff at and I liked his theme music as well. I was less impressed with his partner Neon, but I suppose she had fun during the fight so that’s nice. Maybe if she trash talked a little better or just didn’t talk much then I would have been more of a fan. Then we’ve got Junior who was humiliated by Yang. He’s not a great character at all, but he is surprisingly brave as he stood up to Yang after she demolished all of his men. His two subordinates were great though as the twin dancers really gave Yang a run for her money. Then we have the original Spring Maiden Amber. She was clearly not a great fighter as she was beaten rather easily even though a Maiden is supposed to be crazy strong. She should have practiced more and I question what she was doing all by herself anyway. Lionheart is one of the more recent villains and he’s definitely no good. He’s not meant to be an interesting villain anyway though as you’re supposed to notice how cowardly he is and then shake your head. There aren’t really any good qualities about this villain and it doesn’t help that he is also super weak. 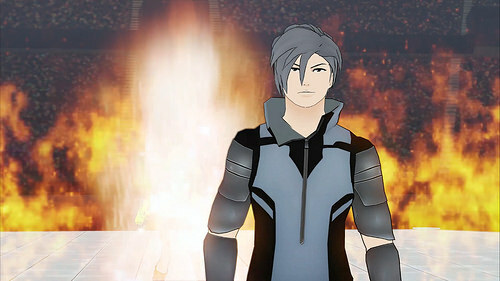 Watts is one of the members of the villain group, but he has yet to fight. Still, he is a solid villain so far as he really likes taking shots at Cinder. He always knows just what to say and that’s why he also needs to be a good fighter just to make sure that he can back up the tough talk. Sienna was the leader of the White Fang who was hyped for quite a while so it was rather funny how her plot ended. She was a good character, but definitely not a particularly smart one since she didn’t seem to see any of the events coming before they happened. Finally, there is also Adam’s right hand man who fought Weiss during season 2. He never got to get a final fight to finish up his character arc, but from how decisively he was able to defeat Weiss we can tell that he is very powerful. It would be great to see him fight again, especially since the character has no name at the moment. You can probably accurately surmise how I rank all of the volumes at this point, but I’ll spell it out anyway. Volume 3 is still definitely the best one. It had a large tournament which I am a huge fan of and the best climax. Volume 2 would be my next pick as the fights were top notch as always while still embarking on more of a plot. The third highest is the toughest pick as I go back and forth with them at times. I think I would actually go with Volume 5. Whether it is recency bias or volume 5 having more of a plot and a lot of epic scenes, I have to give it the edge here. Missed opportunities aside, they don’t take away what the show actually did right and it certainly still held up the proud standard of quality that RWBY stands for. Volume 1 is close behind. 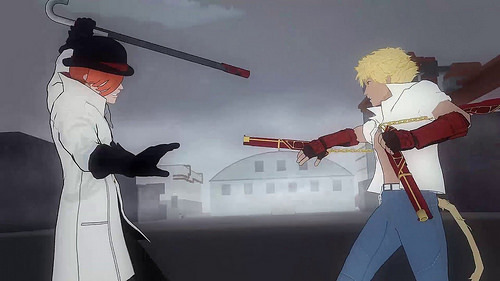 It’s still very nostalgic with the retro animation and Blake’s battle against Torchwick holds up really well. Finally we have Volume 4. A good volume, but one that could have certainly benefited from better pacing. Overall, Now you see why I say that RWBY is the greatest show of all time. I don’t have to go over the soundtrack and animation again like in most reviews since I already touched upon it in each of the volume sections. They are absolutely top notch and it’s hard to imagine that it used to be more of a fan project. I’ll have a review for RWBY volume 6 when it finishes so you don’t have to worry about waiting for another 5 volumes before I churn one out. I’m definitely expecting big things from volume 6 and won’t be satisfied unless it is able to at least crack the top 3 from the volumes. At this point the action should be coming fast and hard with enough subplots and loose ends to keep the pacing quite frantic. Naturally in a show this long it’s hard to express everything about it, but I feel like I’ve gotten all of the major points. I definitely went from not knowing about the franchise to being obsessed with it in a short time. Ah well, only about 6 months until RWBY returns so that’s not so long. That’s not the end for my reviews on the franchise though. 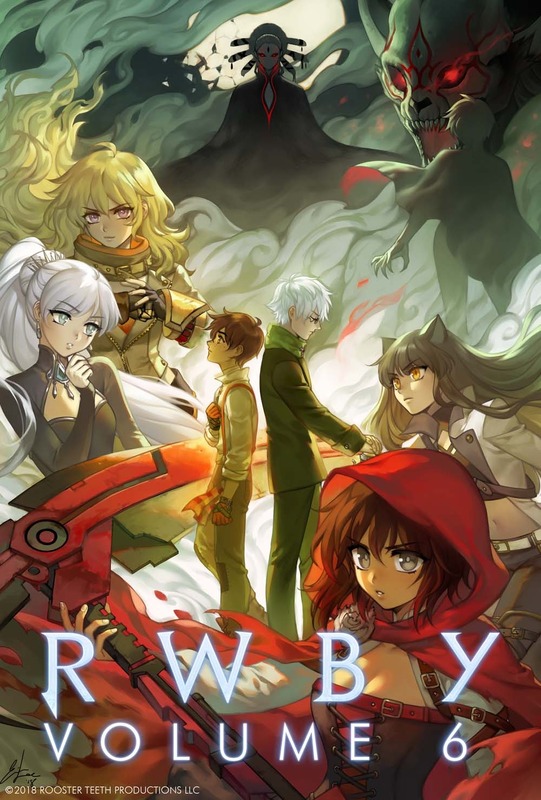 In the mean time, I’ll also be reviewing RWBY Chibi once the latest season ends and RWBY manga that should be coming out soon.